So, life has a way of happening. I now have four children. Baby Four was born recently. The pregnancy was rough (though normal). Having an infant is actually easier in a lot of ways. I just got my “sewjo” back and signed up for Monday Open Sew at the local quilting shop. I figured that I wouldn’t stay for the whole thing, but I wanted to talk to adults other than my husband, and I really wanted to produce something again (other than a baby). 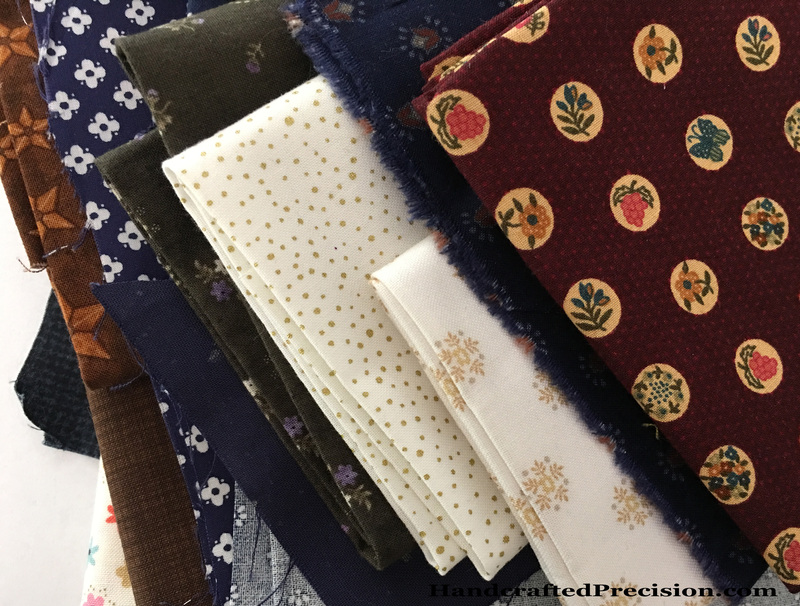 I hadn’t worked on anything in a year and really didn’t want to schlep my sewing machine and/or rulers and cutting mats along with the baby, so I just brought a box of fabric scraps and EPP supplies. The fabric I’ve been putting off using for years is a 8″x8″ test swatch of tiny molting grackles by meduzy on Spoonflower. 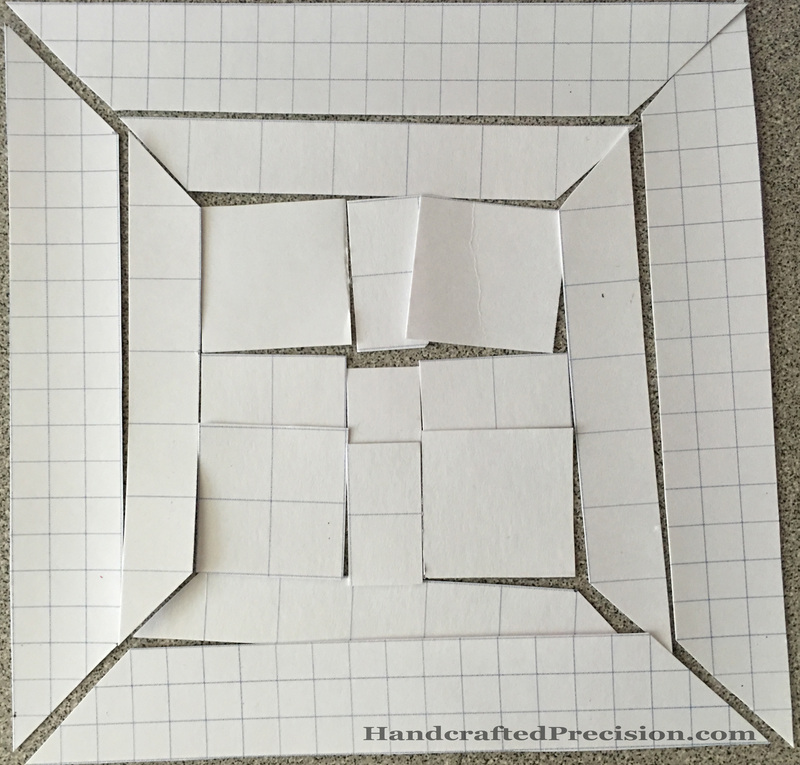 I decided to just use some 2″ and 4″ square papers and just cut into the thing already. The photo above is most of what I got done at the Open Sew. I don’t know where I’m going with it. It might end up being a little wall hanging or a pillow or part of something bigger. I wish the designer on Spoonflower had more animals in the same style and color scheme, but she really doesn’t, aside from a mouse. I’d rather leave it at just the grackle. When I got home and got Baby Four (we’ll call her “Qua”) to nap, I cut out some more papers and ended up with the scheme above, which is a five-inch block. The center square is 1/2″ on a side. I plan to have not many that small. I was actually trying for bigger pieces, but I guess that’s hard for me. Part of it was dictated by the fabric, though. The layout above is very, very tentative. I ordered more of the grackle fabric and I’ll see what I can do when it gets here. I’m trying to only add bigger pieces than what I have here. 1/2″ is too small for a rectangle, though it’s not bad for hexes. 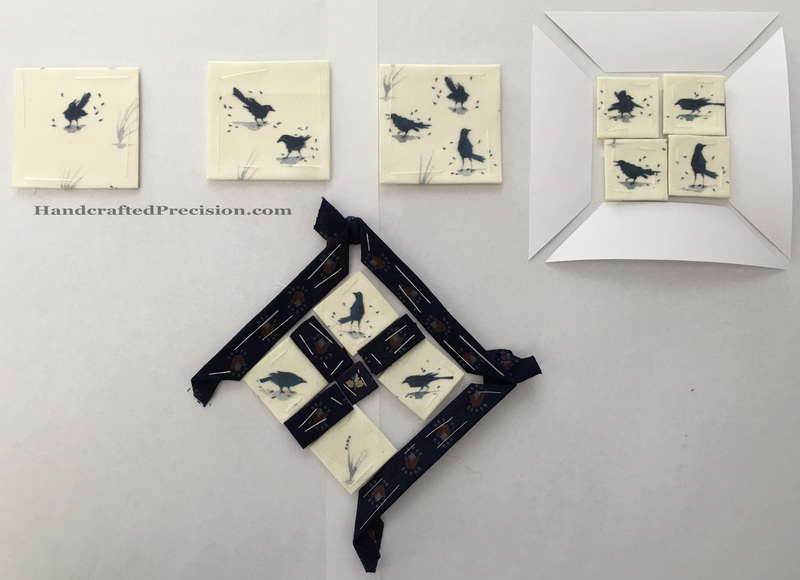 The top 2″ grackle rectangles are framed out to 4″. I’m not sure how it’ll all fit together yet. I’m calling it “Molting Grackles” for now. Feast your eyes on the fabric I pulled for this project. It’s mostly scraps, with a few fat quarters for good measure. We’ll see if I end up using it all and/or if I have to add to it. Both seem likely. It’s looking very red/cream/blue muted oldstyle. I truly thought I was more modern than that. Maybe not when I’m EPPing. This entry was posted in English Paper Piecing, Fabric Scraps, Hand Sewing and tagged Grackle Party on May 10, 2016 by HP.